CMA organised an Awareness Session on Sexual Harassment at Workplace on 05th August, 2017 at Mahatma Gandhi State Institute of Public Administration (MGSIPA), Sector 26, Chandigarh. Mr. S.B. 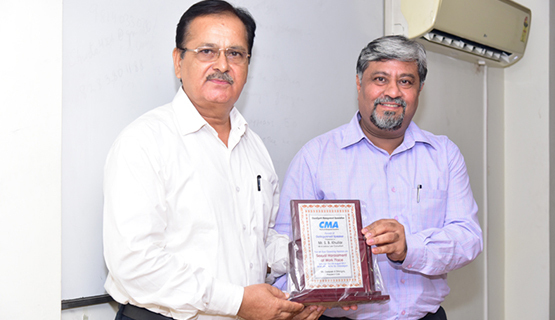 Khullar, HR & Labour Law Consultant was the Key Note Speaker, who with his deep knowledge on the subject enlightened the CMA members. An hour’s audio visual session was attended by above 50 members. For the first time in the history of CMA, an online survey on the awareness about this act was conducted among the members and the results thereof were analyzed in real time and shared with the audience.